Encore Ultra-Hi Flow Diesel Dispenser | CSESCO INC. The truck stop environment requires rugged fueling equipment solutions that are both durable and reliable, because time is money to you and your customers. With the most flexible choices in fueling equipment configurations, as well as excellent POS and back office compatibly, the Encore Ultra–Hi flow is powered by top–of–the–line features to give your customers the ultimate fueling experience. With incredibly fast flow rates, Gilbarco Veeder-Root'sHi flow masters and satellites for retail truck stops are made to last and reduce the amount of time it takes to pump and pay. You can sell more fuel during busy periods at your diesel fuel pumps, and your customers get back on the road faster. Pump up to 63 gpm* models combine to offer the most rugged, economical and flexible diesel fueling equipment choices. *Assumes 30 psi inlet pressure. Flow rate for master and satellite used separately is about 32 gpm each. Actual results may vary. The fueling equipment configurations from the Encore® S, Encore®300 and Legacy product families are interoperablesided satellites. Or Combo dispensers (master on one side and a satellite on the other) provide a consistent look to your fuel island. You can also use Legacy satellites with Encore masters for an economical solution. 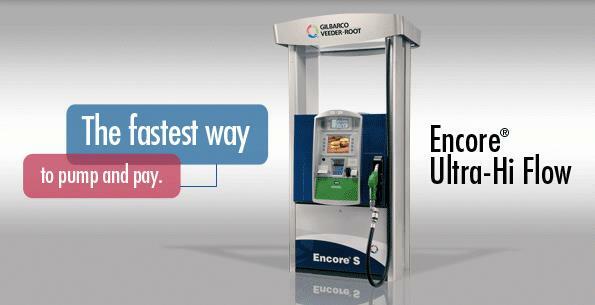 Encore S and Encore 300 Ultra–Hi masters use Gilbarco® CRIND® card reader in dispenser for fast and secure payment at the forecourt. Gilbarco's standard dispenser interface is compatible with your Gilbarco Passport® point of sale (POS) system, as well as most third&party c&ndashstore POS systems and back office systems. Encore modular dispenser electronics make it easy to upgrade to new features in the future. Buy the features you need today and keep technology options open for the future as your business grows.